Aleesah Darlison’s Unicorn Riders series is bound to be a hit with readers eight and up, particularly girls. Darlison includes all the ingredients of a successful story: firm friends, beautiful and magical animals, a mystery to solve and a quick-moving plot. Living in the magical kingdom of Avamay are the Unicorn Riders, four friends called Willow, Ellabeth, Krystal, and the heroine of this story Quinn. Each has her own uniform, symbol, unique skill and unicorn with its own magical power. 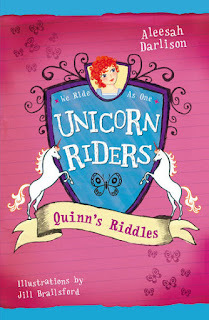 In Quinn’s Riddles, Queen Heart calls upon the Unicorn Riders to rescue her son who has been kidnapped. A cryptic note has been left by the kidnappers and Quinn, who has a knack for solving riddles, is called upon to help find the whereabouts of Prince Simon. Throughout the quest, the kidnappers have left more notes and Quinn must use her skill to help them locate and save the young prince. But the greatest riddle that Quinn solves is the one of her very own family. Jill Brailsford’s black-and-white illustrations add to the charm and the girl-appeal of the book. Liberally sprinkled throughout—there is barely a page without one—the illustrations break up the text making the book very child-friendly. A map of Avamay also allows readers to follow the journey of the Unicorn Riders. This book is the first in a series of eight, of which three more titles are currently available. Girls will be anticipating the release of further titles in the series. Vicki Stanton is the editor and publisher of Buzz Words, an e-zine specifically catering to writers and illustrators for children. She is currently undertaking an Australian Society of Authors Mentorship. This looks amazing! Ever since I read Narnia I've wanted to ride on a unicorn, or at least a flying horse! @PerogyoWhen I am Boss of the World, flying horses will be mandatory! And magical lands inside cupboards or at the top of trees. @Persephone PinchgutSo cool to have one of the Twins visit, Persephone! This looks like a great series. I'm sure Miss Possum would love this when she's old enough to read it. I was luck enough to read and excerpt at the end of last year and it really did make me want to read on. @PennyDon't you just love books that grab your interest right from the start!